Are You Smarter Than A Bolt? Of course you’re smarter than a bolt, but SmartBolts are still pretty crafty — they can show you if they’re loose, tight, or overtightened. For the average Toolmonger, this is overkill; we’ll break out the torque wrench if we need to know when the bolt’s tight enough. When it’s not critical, the grunt method works — one grunt for tight, two grunts for really tight. However, neither of these methods will show you if a bolt has loosened over time. When a bolt is tightened, the tension in the bolt causes it to stretch a few microinches. When the SmartBolt stretches, the colored indicator pulls away from the top of the bolt to give a visual indication. Remember, torque isn’t always directly related to tension — friction between the threads from plating, rust, or scale can cause a bolt to require more torque to reach the desired tension. 8 Responses to Are You Smarter Than A Bolt? This could be great for use on some of the exhibits we have at the science center I work for. We’re always having to do quick checks on many of our exhibits for safety concerns/etc. Being able to visually look for loose bolts could be a real time saver. I’ve always just used a dab of paint (or nail polish) for non critical, and safety wired critical bolts. What I wonder, what if your specs are not the same specs as what the bolt indicates as tight? Cool idea, if it fits your application. Slick idea, way too pricey for common use though. wel depending on the material, application, etc, sometimes a torque wrench doesnt accuratly measure the instalation of the bolt. 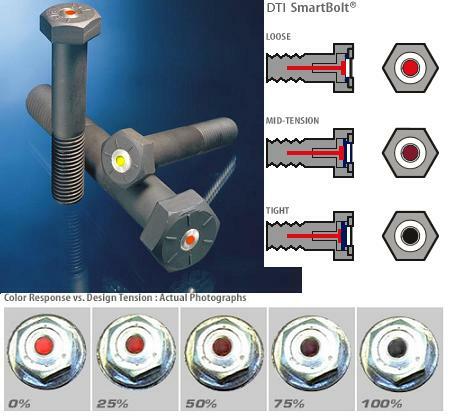 This is measuring bolt stretch, much more indicative of proper instalation…. but for what i do, ill use the torque wrench…. How reliable and accurate is this? Will it be accurate over the lifetime of the bolt? I work for Stress Indicators, and SmartBolts is our product. We did not contribute to the article, but are pleased with the accurate piece the writer put together. Your comments are also on the mark. To answer a couple of your questions: the indication tension can be customized to meet the needs of the application. The indicator mechanism is fully re-useable, and is expected to work reliably for the service life of the fastener. Smarter than a bolt? They should make these for people… like a little gem that goes on your forehead to indicate whether you’re confused or whether you understand what’s happening. Those look darn crafty. However, I worry about how much you can trust such a simple indication method in what will inevitably be a very high end application, perhaps involving at least one persons life.